This is what happens when Delahaye USA, a company from New Jersey, attempts to build a replica of one of the most esteemed and sophisticated classics ever, the Bugatti 57S. Might as well call the carbon fiber "Bella Figura" the "57S Atlantique City." Buying an original Bugatti 57S is basically out of the question unless you've got Oprah-deep pockets. One specific example sold for $40 million. To buy one is to buy taste. I'm not sure the same can be said of the replica when bodied in a bright metallic skin. It's a manageable reproduction/upgrade, but wanting an original 57 is being nostalgic for a certain era of free-spirited motoring for the wealthiest. Not the feeling I get from the press release. Much more than a replica, this artistically stylized, stretched and widened coupe comfortably fits two six-foot-six occupants. While respecting the classic Bugatti look and feel, the Bella Figura is built to modern standards in all other respects, including air conditioning, power brakes, steering, and windows, choice of interior and exterior finishes, and modern affordable engines selected to suit 21st century driving conditions. It just doesn't sound right, but maybe we'll feel different when we see it at Pebble Beach. 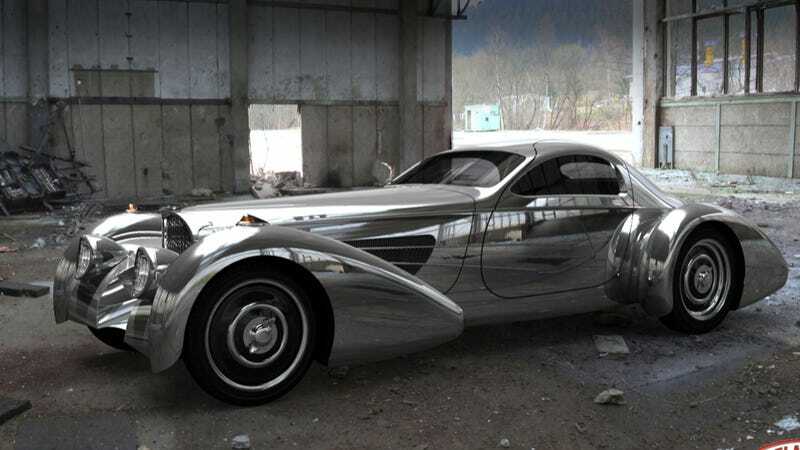 The other vehicle the company plans to trot out for the Rolex-and-Zantac set is their take on a Boattail-style speedster. A bit more promising, but it's certainly no Bugnotti. But if you're going to pose I guess you should pose as the best.